In 1983, President Hosni Mubarak visited Pyongyang in the Democratic People’s Republic of Korea. He met Kim Il-Sung, and the Korean leader agreed to furnish the artists who would depict Egypt’s war with Israel in grand style. This museum was the result. The IMAX-sized walls display a socialist-realist rendering of a glamorized theater of war. Plumes of smoke, tanks rolling perilously near cliffs, fires and barbed wire and shrubs and tires and bullet shells and abandoned, bloody uniforms. The seating area in the middle of the 360-degree image turns slowly, and your eyes adjusted to realize that in front of the painting sits a three dimensional diorama seamlessly integrated to connect your seat to the painted background. It’s just awesome. Here’s more about it. Tickets are 20LE. It might be closed when you arrive, but if you get there, go to the International Bowling Club just behind. 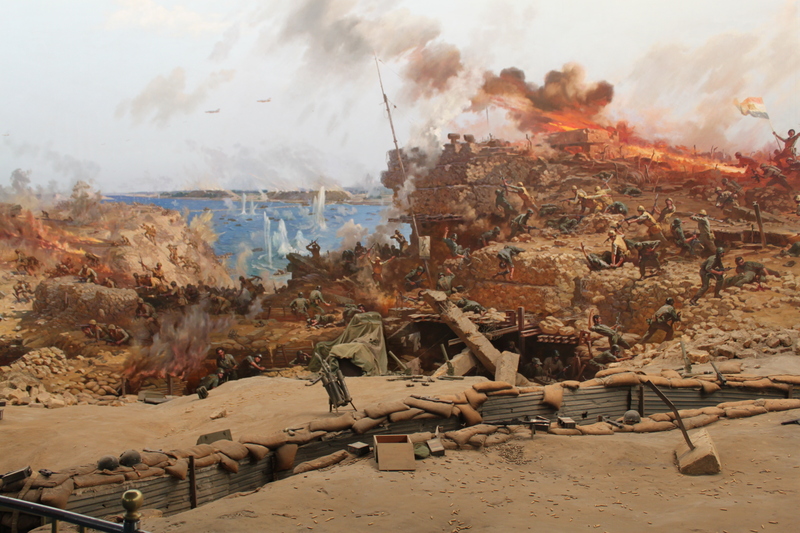 Also along these lines is the Military Museum in Port Said (23rd of July Street), kitted out with grand-looking panoramas all painted in Korea. It does have a fairly good room on the Suez Canal (context, construction, nationalisation) though. I should have known you’d already reviewed the museum in Port Said! Excellent stuff.